it an ideal replacement for hard disk drives. correction and detection, full data path protection, thermal monitoring, and data fail recovery. 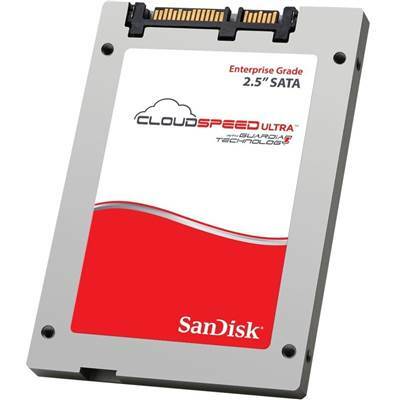 CloudSpeed Ultra SATA SSDs are powered by SanDisk’s proprietary Guardian Technology Platform, a suite of enterprise features that include FlashGuard, DataGuard and EverGuard technologies. FlashGuard Technology combines Aggregated Flash Management, which treats all flash elements as a single system, and Advanced Signal Processing, which dynamically adjusts flash parameters throughout the life of the SSD, to reliably extract significantly more life from cost-effective 19nm eMLC flash, making it suitable for mixed-use application workloads. DataGuard Technology features full data path protection, safeguarding user data from corruption along all data paths in the SSD. EverGuard Technology protects against loss of user data in the event of unexpected power interruptions using a 3rd generation backup power circuit design and high-eliability discrete capacitors.